When it comes to truly wireless headphones, the Apple effect is in full force right now. Apple’s AirPods weren’t the first cord-free wireless earbuds to hit the market, but every other company rushed to get in on the action once Apple entered the space. There was one company that didn’t rush though, and that’s Bose. Why didn’t it rush? Because Bose took its time to get things right, and the result is quite possibly the best pair of truly wireless earbuds on the planet, AirPods included. 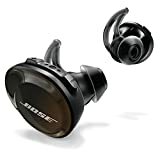 The Bose SoundSport Free Truly Wireless Sport Headphones are on sale on Amazon right now for $50 off, and we highly recommend picking up a pair while they’re discounted.